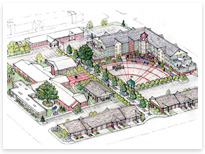 The rendering shows our concept for a senior living facility in Gillette, Wyoming. Gillette has traditionally been a town with a young population, often following the boom and bust cycle of the energy industry. Our concept was of a welcoming and livable home, attractively landscaped, that would appeal to people wanting to retire in this community. 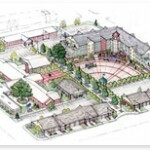 We explored the possibilities inherent in a site near the center of Gillette for the senior living complex. The site, originally the home of the town hospital, had morphed into the first home of the community college, and was now available as the College had moved to a new Campus, designed by our firm, on the edge of town.